Note that the film Possession is based on a real story to which wasnt made up for a Hollywood horror film, these true events happen to a few people that owned this box. The term "Dybbuk Box" was first used by Kevin Mannis to describe the box in the item information for an eBay auction to describe it as the subject of an original story (not the story for the film) describing supposedly true events which he considered to be related to the box. Mannis, a writer and creative professional by trade, owned a small antiques and furniture refinishing business in Portland, Oregon at the time. According to Mannis' story, he purportedly bought the box at an estate sale in 2003. It had belonged to a German Holocaust survivor named Havela, who had escaped to Spain and purchased it there before her immigration to the United States. Havela's granddaughter told Mannis that the box had been bought in Spain after the Holocaust. Upon hearing that the box was a family heirloom, Mannis offered to give the box back to the family but the granddaughter insisted that he take it. "We don't want it." She said. She told him the box had been kept in her grandmother's sewing room and was never opened because a dybbuk was said to live inside it. On opening the box, Mannis found that it contained two 1920s pennies, a lock of blonde hair bound with cord, a lock of black/brown hair bound with cord, a small statue engraved with the Hebrew word "Shalom", a small, golden wine goblet, one dried rose bud, and a single candle holder with four octopus-shaped legs; all items supposedly used in Jewish folklore to exorcise demons. Numerous owners of the box have reported that strange phenomena accompany it. In his story, Mannis claimed he experienced a series of horrific nightmares shared with other people while they were in possession of the box or when they stayed at his home while he had it. His mother suffered a stroke on the same day he gave her the box as a birthday present — October 28. Every owner of the box has reported that smells of cat urine or jasmine flowers and nightmares involving an old hag accompany the box. Iosif Neitzke, a Missouri student at Truman State University in Kirksville, Missouri and the last person to auction the box on eBay, claimed that the box caused lights to burn out in his house and his hair to fall out. Jason Haxton, Director of the Museum of Osteopathic Medicine in Kirksville, Missouri, had been following Neitzke's blogs regarding the box and when he was ready to be rid of the box Neitzke sold it to Haxton. 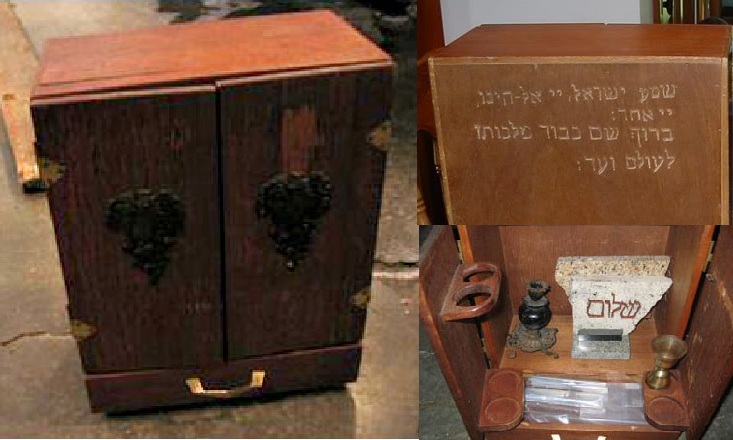 Haxton wrote The Dybbuk Box, and claimed that he subsequently developed strange health problems, including hives, coughing up blood, and "head-to-toe welts". Haxton consulted with Rabbis (Jewish religious leaders) to try to figure out a way to seal the dybbuk in the box again. Apparently successful, he took the freshly resealed box and hid it at a secret location, which he will not reveal. Skeptic Chris French, head of the Anomalistic Psychology Research Unit at Goldsmiths' College, told an interviewer he believed that the box's owners were "already primed to be looking out for bad stuff. If you believe you have been cursed, then inevitably you explain the bad stuff that happens in terms of what you perceive to be the cause. Put it like this: I would be happy to own this object." The Following is a statement from a owner of one of these dybbuk box's what your about to read is real it is not a joke or fictional by Hollywood film the possession, these boxes are real & are not to be opened at any cost, if you find one buried it or put it in concrete don't open it or destroy it :This is a eye witness account of what happen when one owner open the box. by the winning bidder with the copies of hospital records and sworn affidavits that I am including as part of the sale of the cabinet. I explained that I didn't want my money back, and that it would make me feel better to do what I thought was an act of kindness. She then became somewhat upset. Looking back now, the way she became upset was just plain odd. She raised her voice to me and said, you bought it! You made a deal! On Jun-14-03 at 05:216 PDT, seller added the following information:Here is another update for everyone following this listing. NO! No, I will not circumvent, or make any deals outside of EBAY - EVEN FOR MORE MONEY THAN THE FINAL AUCTION PRICE!!! If you want to win the auction and have the kind of money some of you are offering, there shouldn't be any reason why you cannot simply place your bid in an open honest fashion. I'm sure you can understand why I might be suspicious.ALSO....For those of you wanting to know if I am still experiencing anything out of the ordinary, I thought everything was going OK until I got home on Friday - the 13th of June - and found that the fish in my fresh water aquarium - all 10 - were dead.I'm still hoping that all of this is coincidental . Achei estranho um comentário em Português. Como conseguiu uma dessas caixas? It's just the Shema. The inscription on the box is just the Shema, Jews recite it every morning and every evening. It says "Listen o Israel, the lord our God, our God is one. Blessed be the name of his glorious kingdom for ever and all time." It is literally the most common Jewish prayer. What is in the box is an old time Havadalah set. It is amazing the stories people make up about Jews and Jewish objects.